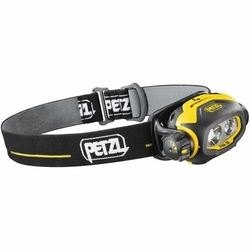 Petzl PIXA 3R Headlamp. The PIXA 3R headlamp is a rugged, rechargeable headlamp suitable for frequent use by professionals. It may be worn on the head, mounted on the helmet, or placed directly on the ground. The integrated rechargeable battery makes it a practical tool an and economic and ecological alternative to regular batteries. The multi-beam adapts to all situations: close range vision, movement, and long-range vision. CONSTANT LIGHTING technology: brightness does not gradually decrease as the batteries are drained.